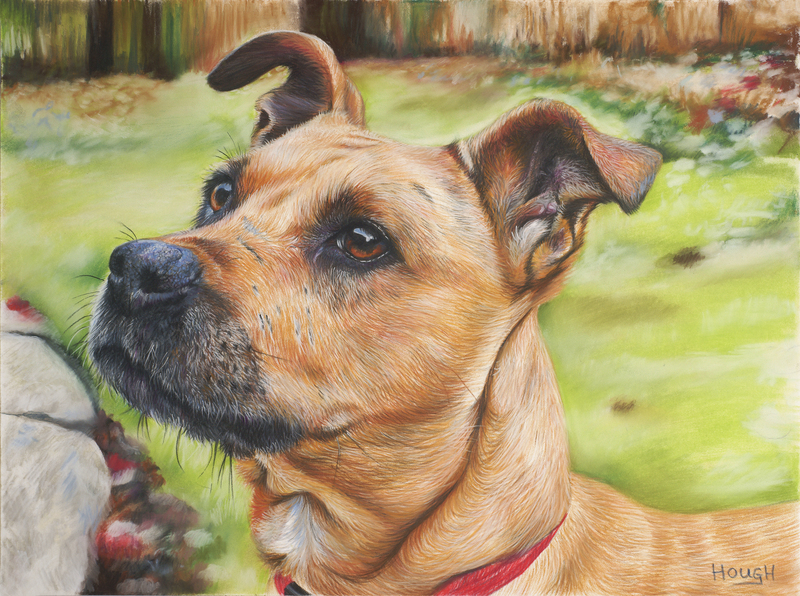 Ordering your pet portrait couldn't be simpler! All you need to do is either e-mail me, telephone, contact via facebook/messenger or alternatively send your actual photographs through the post for me to see. I do ask that if actual photos are to be used as reference that they are clear and sharp and of good quality and that the animal subject is shown clearly on it. Please see my Photography Hints/Tips section for some advice on how to achieve the best results when taking your pet's photograph. I will also need your name, address, e-mail address and contact telephone number if I need to contact you regarding the portrait. Alternatively, you can e-mail me via the e-mail contact form at the foot of this page if you prefer. Once I have your details and the information/photos for the portrait I can then book you into my commission schedule. It is always wise to state when the portrait is needed by as I often have other ongoing works to complete. I often have tight deadlines for my artwork to completed in good time I always think that it is the safest policy to place an order between 6 weeks to 3 months before it is actually needed - it can then be scheduled in to be completed at the right time. When the portrait is underway, I will e-mail you to ask for your feedback - if that is done at this early stage, then I will know that you are 100% satisfied with your pet's likeness. I always paint the eyes and main features first to "set the scene". I will continue to send further photographs of the portrait on a regular basis to let you see the progress. Once complete, the portrait will be ready for you to view online - via your e-mail account or Facebook messenger - once you have approved it as being exactly right and are happy, the next stage is payment. I am registered with Paypal, so it couldn't be easier to pay for your portrait. However, please be advised that a fee may be payable to use this service charged by Paypal. The prices I charge are not inclusive of this extra charge levied by paypal. I do not pay this fee myself - it is my client's responsibility to do so if they wish to use PayPal's service. I do take cheques too - but please allow time for them to clear prior to despatch of your portrait. Once the portrait has been paid for plus the postage and packaging costs, it is then ready for its homeward journey to you! See the postage and packaging section for more information. Please be aware that by commissioning me you are entering into a contract and payment is due on completion of your pet portrait. Deposits are at my discretion and are usually 40% of the total cost of the portrait - usually for overseas orders, larger sizes and multiple orders. All the photographic images that you see on this website are used with the client's/photographer's full permission. As an artist, I own the copyright to the artwork, but if a client's photograph has been used for reference by myself to produce the artwork, then permission must be granted by the client for me to display their photograph. (Also to take the image to print - for example - greetings cards and giclee prints).